Nothing beats splashing around with robust hopper patterns. With the end of winter only a few months away, a sense of urgency swells in the minds of most serious fly tiers. Choosing what patterns one is going to fill their fly boxes with is not an easy decision for most, but stocking up with a few terrestrial patterns could never be wrong. Terrestrial patterns encompass a large group of flies varying from ants and beetles to field mice. Although these other land loving critters sound like fun to tie and fish; nothing beats splashing around with robust hopper patterns. 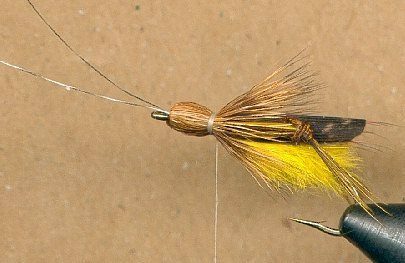 The beauty of these flies is that they evoke vicious strikes from hearty trout while at the same time being very easy to fish. 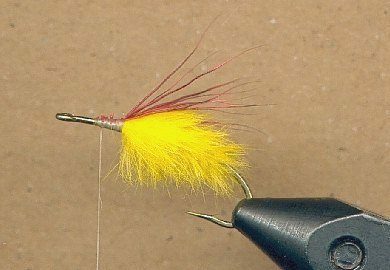 Hopper patterns are basically large dry flies that require no soft subtle presentation. The louder the plop on the landing the better. If you have ever witnessed an actual grasshopper fall to the water's surface you have seen that they are not an insect who gives up easily. These feisty critters will kick and scratch their way to the water edge or die trying. The flopper is a hopper pattern that differs from most others because it is not fished like a traditional dry, but rather in the surface film or submerged like a wet fly. The flopper represents a drowned or live hopper that has been pulled under the water surface by the turbulent current. 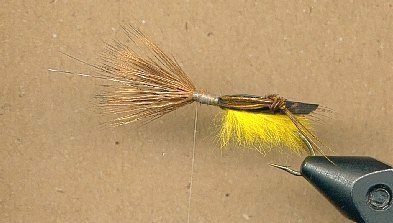 Since the fly is tied without the use of foam or excessive buoyant materials plus having a thick shag body getting down deep in the water column should not be too much of a problem. The best conditions for using this fly pattern are fast flowing rocky rivers surrounded by long grassy fields. 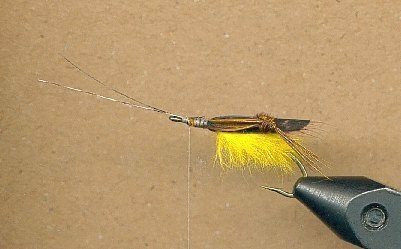 Simply cast the fly across and upstream from the target rocky run, and give one or two quick strips of line to pull the fly under. After the fly is submerged or riding low in the film, let it drift as drag free as possible, but be sure to collect the extra line as the fly nears your position. Watch how the fish react to the fly. If they are taking the fly early in the drift, while the fly is still riding high in the water column, a little floatant applied to the bullet head will keeping the fly floating just beneath the surface and the fish happy. If the fish are waiting for the fly to reach the depths of the run a lead-free shot applied a foot above the fly will help to get the fly down faster. If you are seeing fish follow your fly but not take it, try giving the fly a few upstream strips near the end of the drift, this sometimes help those indecisive fish to bite down and bite down hard. 1. 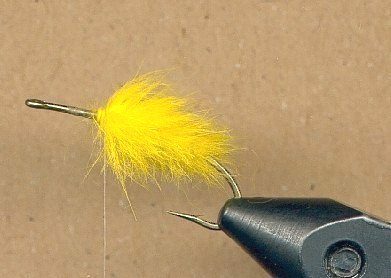 Start this fly by placing the hook into the vise securely and attaching your thread just behind the hook eye. 2. With your dubbing needle or a toothbrush tease out the dubbing rope and cut the shaggy dubbing down close to the center of the rope. Smooth all the extending dubbing fibers to one side of the rope and proceed to wrap the up the body of the fly. 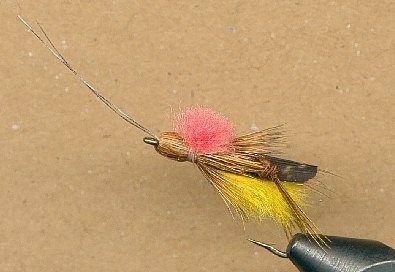 You might need to make two to three dubbing ropes to cover the entire body of the fly, depending on how much dubbing you place in the loop at one time. Just remember with each new dubbing rope you make to cut the teased out fibers just a little longer each time to get a nice tapered shape to the body. 3. After you have reached the halfway mark on the hook shank with the dubbing, clip and stack 7-10 red deer hairs. Tie these hairs on top of the back of the fly and clip the tag ends short. The deer hair should reach just about to the end of the hook shank. 4. With a small application of flexament fix a small section of fibers from a mottled turkey feather. Allow the flexament to dry and cut the end of the wing into an arc shape before tying it down on top of the fly body. The wing should extend almost to the end of the fly but be a little shorter than the red deer hairs. 5. 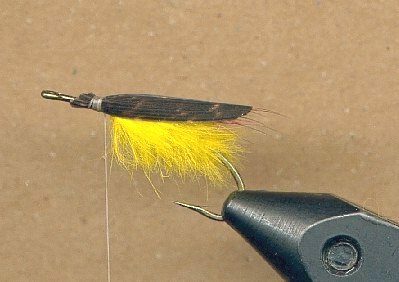 With the wing in place clip two separate legs (one from the right and left sides of the feather) from the Montana Fly Company “Legs On A Stick”. If you want can tie your own pheasant tail legs by knotting a few of the feathers you have lying around, but believe me the time and headaches you will save but purchasing these premade can not be understated enough. With one leg tied onto each side of the fly body wrap down the antennae for the head extending over the hook eye. You can place the antennae on in the last step if you like with a little zap-a-gap glue but tying them in place holds much better in the long run. 6. Clip a small patch of deer hair about the size of pencil from the hide and proceed to clean and strip the fuzz from the ends of the hair. Align the hair tips evenly with your hair stacker and tie it onto the hook shank extending over the hook eye about 1 ½ times the hook gape. 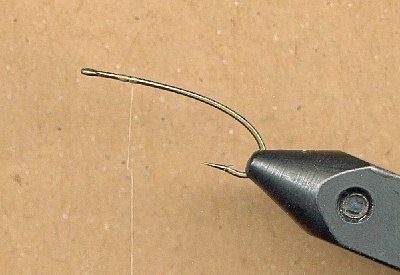 Make sure to spin the deer hair equally around the hook shank and to wrap the thread right up tight to the back of the hook eye. 7. Before forming the bullethead, wrap the thread back about four to five turns to place the thread into the tie off position for the head. Now with your fingers or a bullethead maker pull the deer hair back over the body (making sure not to pull the antennae back) and take 2-3 turns of threads to hold things in place. Inspect the head of the hopper you just created to make sure the deer hair was pulled back evenly and that no bald spots are present. If there is small patches of no hair simply unwind your thread and release the hair. Repeat the procedure for forming the bullethead but try twisting the hair slightly to cover where the bald patches were previously. 8. Once you are happy with the shape and size of the bullethead you have the choice of tying in an indicator or not. If you planning to fish the fly in the surface film it is good idea to have the indicator present so that you can see the fly easier, but it is not necessary. Personally I carry a few of each type in my fly box, some with out indicators to be fished down deep and a few with indicators for the surface film. Either way whip finish the head and cement thoroughly.